Have You Ever Picked A Carrot? : Sow You're Telling Me There's a Chance...Yeah! it's a great feeling to say the least. After amending the bed from kelp to finish, I was sent out to the seed closet to find the mache seeds. After a good 45 minutes of being lost/mezmorized looking through all the seed boxes and being surprised at how many Italian words I understood on each seeds packet with my knowledge of Spanish, I managed to locate the mache and like a 5 year old with a brand new toy, I ran back to get started. So Adrianna, the current Greenhouse apprentice, helped me understand the inner workings of this fancy seeder. Basically there are four seed holders that have a sharp end that creates a little indent in the soil depending on what angle it is held. 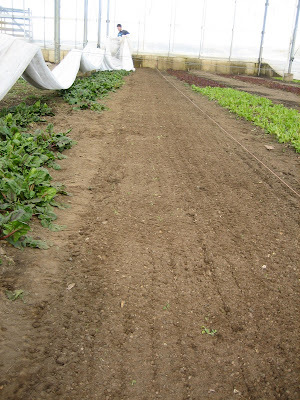 Each seed holder releases one (hopefully just one) seed as the outer wheels are rolled along the fresh bed of soil. The wheels are connected by a metal pole that has 4 different seed sized grooves that help control how many seeds are dropped during each spin. It's important to use the right groove size. The key is to hold the seeder at slight angle so that the seed gets dropped in the soil and not just left helpless at the top. This prevents birds and other pests from getting to the seed before it has a chance to germinate. It's also good for the seed to have contact with the soil so it can begin building an intimate relationship. Well there it is, my first Popsicle stick seed marker. It's been a few weeks, but still too early to tell if it's going to be a boy or a girl.